WE subjoin the official vote of this county, by which it will be seen that the majority for LINCOLN is 2,139, the largest ever given to any candidate. This speaks well for the home of Gen. SIMON CAMERON, and shows that old Dauphin is sound to the core on the great questions of Protection to American Industry, the rights of Free Labor, and resistance to the aggressions of Slavery. All honor to the active an enthusiastic Republican young men of this city and county, who were mainly instrumental in the achievement of so glorious a result. In the midst of an Indian Summer, the people of Pennsylvania took to the polls on Tuesday, November 6, 1860 to cast ballots in a momentous Presidential contest to decide the fate of the Union. Atop the Republican ticket, Illinois upstart Abraham Lincoln ran on a platform based on the limiting of slavery’s spread to the western territories, ending the crisis known as “Bleeding Kansas,” import tariffs to benefit burgeoning American industry, and, interestingly, maintenance of loose immigration statutes. 14. That the Republican party is opposed to any change in our naturalization laws or any state legislation by which the rights of citizens hitherto accorded to immigrants from foreign lands shall be abridged or impaired; and in favor of giving a full and efficient protection to the rights of all classes of citizens, whether native or naturalized, both at home and abroad. On the opposing side, the Democratic Party lay in shambles following a campaign season that witnessed a Southern walkout over the selection of Senator Stephen Douglas as the party’s nominee. The party had been broken into Northern and Southern factions, with the Southern Democrats running Vice President John Breckenridge of Tennessee as their candidate. The issue of slavery and its expansion riled the Southern Democrats and led to cries of “Disunion!” if the Republicans should win. And with the Democratic split, it seemed that the election of Abraham Lincoln was almost assured. An attempt at a fusion ticket, combining the Democratic Party’s votes, failed to muster major support in the Keystone State. A third-party run from another Tennessee politician, John Bell, also received little attention. In Central Pennsylvania’s Dauphin County, the final tally was not close. In the county’s northern hinterlands, the industrial powerhouse of Wiconisco Township went all-in for Lincoln. 263 votes for Abraham Lincoln. 117 votes for the Democratic fusion ticket. 14 votes for Bell. In the Pennsylvania Daily Telegraph of Harrisburg, Pennsylvania, the strong support for Lincoln in the Keystone State (Lincoln won with 56% of the vote) illustrated the dominance of the Republican platform. Their words, written a few days after the election on November 9, were confident, yet would not stand the test of time. For by December, the whole country lay perched on the ledge of civil war. 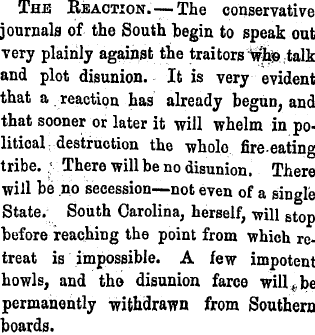 THE REACTION — The conservative journals of the South begin to speak out very plainly against the traitors who talk and plot disunion. It is very evident that a reaction has already begun, and that sooner or later it will whelm in political destruction the whole fire-eating tribe. There will be no disunion. There will be no secession – not even of a single State. South Carolina, herself, will stop before reaching the point from which retreat is impossible. A few impotent howls, and the disunion farce will be permanently withdrawn from Southern boards. The actions of South Carolina on December 20, 1860 proved the editors of the Pennsylvania Daily Telegraph were quite premature with their post-election claims. The American Civil War emerged directly from the aftermath of the contentious 1860 election cycle.